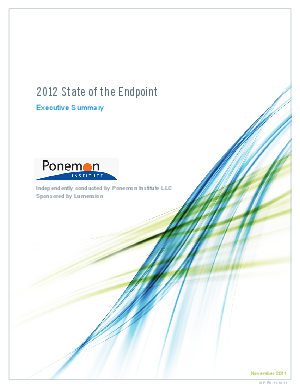 The 2012 State of the Endpoint study sponsored by Lumension® and conducted by Ponemon Institute is the third annual study to determine how effective organizations are in the protection of their endpoints and what they perceive are the biggest obstacles to reducing risk. The study focused on four topics on the state of endpoint security: risk, productivity, resources and com­plexity. The findings are presented in this report.